This is a committee whose Republican members include Darrell Issa, Steve King, and Louie Gohmert, so it will come as no shock to anyone that a topic that sounds like a segment on a Fox News show was not designed to dispassionately explore the nuances of judicial nominations and the workloads of federal judges. So what was this hearing really about? It turns out it was actually about President Obama’s nomination of three highly qualified individuals to the U.S. Court of Appeals for the D.C. Circuit, the court right below the Supreme Court in importance. You might ask why the House of Representatives is conducting a hearing on a subject that is the constitutional purview of the Senate, but the future of the D.C. Circuit is so important that it’s getting the full right-wing, high-volume Sturm und Drang treatment, even in places it doesn’t belong. Of course the real action is on the other side of the Hill where Republicans in the Senate are doing everything they can think of to prevent the president from filling the three seats out of 11 that are currently vacant on the court. The Republicans are threatening a triple filibuster of all the nominees–no matter how qualified they are–claiming absurdly that there just isn’t enough work for the full complement of 11 judges the law requires. They began carrying out their threat today. With these votes the Senate restores the National Labor Relations Board to full functioning. That will ensure fundamental protections not just for union members but for all American workers. For 75 years, the National Labor Relations Act has been the rulebook for relations between businesses and their workers. But a rulebook is useless without an umpire. The members of the NLRB are the umpires. Soon they’ll be back on the field. But that is not enough. Obstruction of judicial nominees is every bit as debilitating as obstruction of executive branch nominees. The same willingness to allow, at long last, yes-or-no votes on the NLRB nominees must extend to the nominees for the D.C. Circuit and other judgeships. We are pleased that the Senate voted to confirm President Obama’s choice to run the Department of Labor. Tom Perez will be an outstanding Secretary of Labor. He has spent his professional career in public service, committed to ensuring a fairer and more just society. 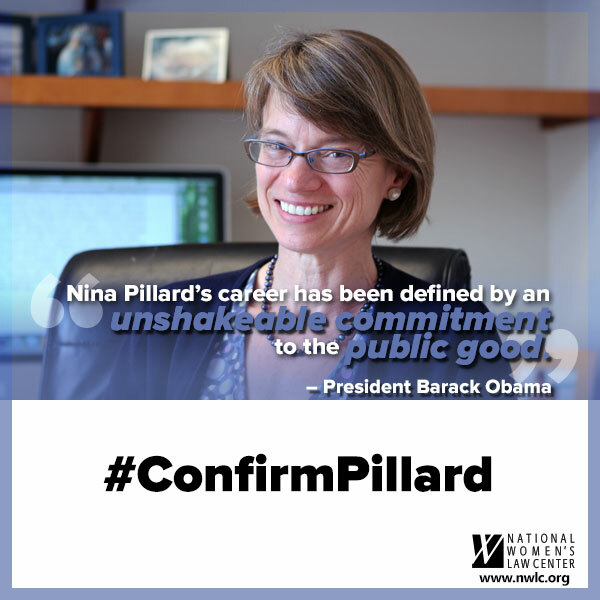 His confirmation is an important step in the fight for the preservation of the fundamental rights of working Americans. This must be only the beginning. The Senate also should confirm the President’s nominees for the National Labor Relations Board and the Environmental Protection Agency. And it must move swiftly to confirm the president’s nominees for the D.C. Circuit Court of Appeals and all federal courts. Nan Aron on "The Broken Senate"
Alliance for Justice is very pleased to be a part of this discussion about the “Broken Senate.” I feel like we’re coming to the end of the fifth season of a bad reality show. But what’s happening in the Senate is not fiction. It’s very real. The abuse of the filibuster has become a threat to the proper functioning of the government and to public faith in the institution of the Senate. 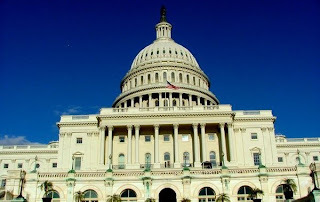 A recent poll by The Economist put the approval rate of Congress at nine percent. That’s incredible, but not really surprising. It does make me wonder who those nine percent are. Family members? Campaign consultants? It’s deplorable that the American people have so little regard for a crucial part of our government. It’s unhealthy for our democracy. And I don’t think there is any question that at least part of the problem has been the rampant misuse of the filibuster in the Senate, which has led to stalemate and gridlock in spite of the enormous problems the country now faces. Let me be clear about something: The filibuster has a legitimate role when used responsibly. But we have entered an era of unprecedented abuse of rules and traditions, which is forcing the Senate to the brink of drastic action. The filibuster traditionally has been used to allow a minority to make a principled stand on matters of enormous and unusual importance. It forces the process to slow down and helps ensure that all voices are heard. It’s a signal that something of significance is at stake. But that’s not what’s happening now. This is the crucial point to understand. As the motivation behind the filibuster has changed and its frequency increased, its legitimacy has declined. The fights over President Obama’s judicial nominees, for instance, are not ideological in any real sense. The president has gone out of his way to nominate men and women from the legal and political mainstream. Who could honestly say that the filibuster of Caitlin Halligan was some kind of titanic ideological fight? Today’s filibusters are just crass politics. They reflect a desire to block the president’s agenda at every turn and feed the insatiable need of a hyper-partisan political base for endless obstruction. We’re in an era where one side believes cooperation is a dirty word—or an invitation to a primary challenge. When that intransigent attitude is paired with a procedural weapon as potent as the filibuster, gridlock is the result. And that’s what makes the situation different today from what it has been in the past. And that’s why the nuclear option is back on the table. targeted tool to a weapon of indiscriminate disruption. The entire legislative process is now held captive to this threat. We’ve gotten to the point where just the threat of a filibuster is enough to derail the Senate. The abuse of the process has created a de facto threshold of 60 votes for action—a supermajority requirement for everyday business that can be found nowhere in the Constitution. It’s important to remember that the problem isn’t just that bills and nominations with clear majorities are stopped, but that many nominations are never made and bills are never proposed, even though they could achieve a simple majority if they were given a chance. There is an invisible price for gridlock that the public never sees. 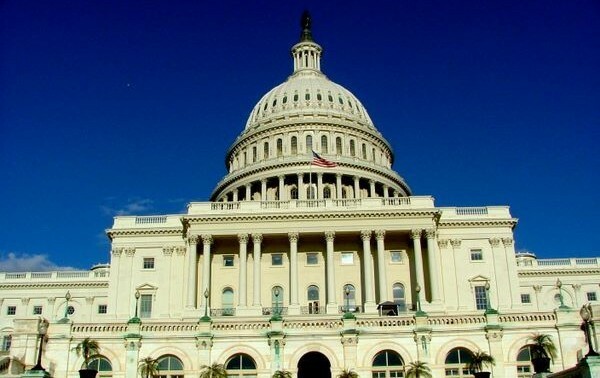 Obviously, the first test will come in the next few days when cloture petitions are expected to be filed on a series of executive branch nominees—Richard Cordray, Tom Perez, Gina McCarthy, and nominees for the National Labor Relations Board. What happens to these highly qualified nominees will set the tone for the rest of this Congress. If Republicans continue their current behavior and prevent final votes, then the choices will be narrowed to two options: allow crucial agencies that deal with hugely important issues to be left leaderless or reform the rules to permit up-or-down votes. But the battle over executive nominees is just the beginning. The next big fight looming later this summer is over the President’s three nominees to the D.C. Circuit Court of Appeals. This is a case of the Republicans engaging in what will be a kind of Group Filibuster, where they don’t even pretend to care about the qualifications or ideologies of the individual nominees. They just don’t want anyone appointed by President Obama to this crucial court no matter who they are. Senator Grassley has complained that the President is trying to “pack the court,” as if filling vacant judgeships is some kind of unprecedented power grab. Republicans pretend to be outraged that the president has sent names forward for empty seats on the 11-member D.C. Circuit–just like every other president has done since the Grover Cleveland administration. This would be laughable if the consequences weren’t so serious. Of course, we know why the Republicans will threaten to filibuster Patricia Millett, Nina Pillard, and Robert Wilkins. The D.C. Circuit is the federal appeals court that most closely oversees the actions of federal agencies on topics like the environment, consumer protections, workers’ rights, banking regulations, and other vital issues. Those are the same issues, by the way, that are at stake in the current executive nominations fights. In some ways, the two big summer battles over executive and judicial nominations are really one big fight over the future of the country. Fair enough. But the question is, will the Senate be permitted to bring these issues to a final vote on the merits, or will procedural hurdles be erected to prevent democracy from functioning. So at some point in the next several months, when the three DC Circuit nominees reach the floor, the Senate will have to make another set of choices, just like the ones it will start to face next week on executive nominations. Either accept the obstructionism of a hyper-partisan minority or change the rules to allow the President and the Senate to do the jobs the Constitution demands of them. For those who care about our democracy and the courts, the choice is easy. The American people are saying enough is enough. The time for reform is rapidly approaching. On Tuesday, the Senate Judiciary Committee held a high-profile hearing on President Obama’s nominee to head the Bureau of Alcohol, Tobacco, Firearms and Explosives, B. Todd Jones. Jones is an exceptionally qualified nominee. 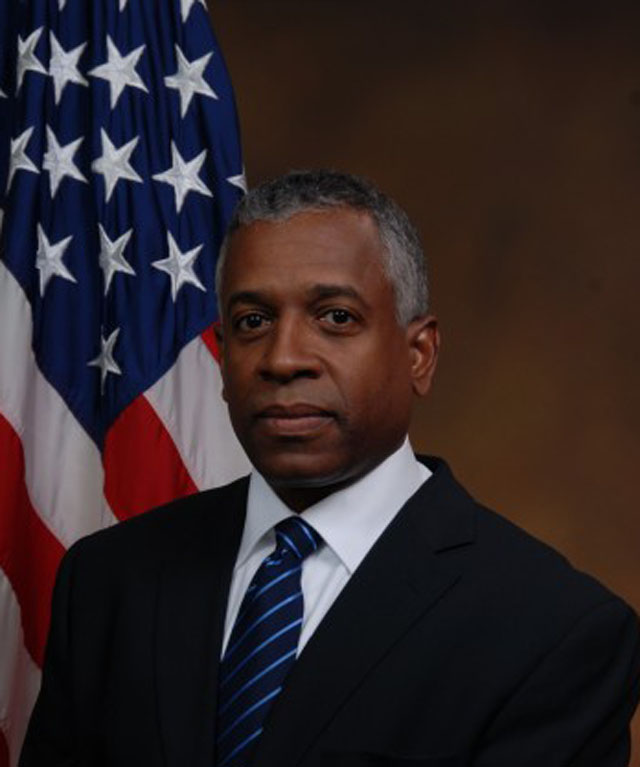 He currently serves as both the acting director of ATF and as the U.S. Attorney for the District of Minnesota (a position for which he was unanimously approved by the Judiciary Committee in 2009). Though ATF plays a critical law enforcement role, including involvement in investigating tragedies like the Sandy Hook school shootings, the Boston Marathon bombing, and the industrial explosion in West, Texas, the agency has not had a permanent director since 2006 – that’s when the law was changed to require Senate confirmation That sad reality may continue, as Republican questions at the hearing suggest that they may continue to obstruct executive nominees as a way to prevent agencies they don’t like from functioning. Many Republican questions raised tangential concerns about Jones’s record. For instance, the Committee’s ranking member, Sen. Charles Grassley (R-Iowa)—yes, the very same senator who wants to get rid of three judicial seats on the second most important court in the country, the D.C. Circuit Court of Appeals—pressed Jones to answer for a botched ATF operation, Fast and Furious. But Jones actually was brought in to clean up after the fact. Of course, Jones is just one of a slew of highly qualified Obama nominees that Republicans so farhave refused to confirm because they disapprove of the organization itself (see EPA Administrator nominee Gina McCarthy, CFPB director nominee Richard Cordray, Labor Secretary nominee Tom Perez, and three NLRB nominees. If Republicans continue to hold agencies hostage by unfairly blocking confirmations, the Senate majority should revisit reforming Senate rules. For many of us it may be the most important contract we ever sign. It’s the contract that sets the terms for what often is our single largest investment – our home. But what happens if the bank that holds our mortgage tries to cheat? What if they improperly hide fees, or raise rates or even try to foreclose on the property illegally? Banks have sought to protect themselves by inserting “forced arbitration” clauses into mortgages and home equity loans. As we’ve noted previously on this Blog, under forced arbitration, consumers who buy defective products or are overcharged for services are barred from taking their cases to court. Instead, they must use a private arbitration firm chosen and paid for by the business itself. These clauses also often ban class actions, which allow individuals to band together to bring their common claims. Having a dispute settled by arbitration is like playing a baseball game in which the other team hires, fires – and pays – the umpires. One study of top arbitrators for one major arbitration firm found that they rule for the corporations that hire them 93.8 percent of the time. One of the reasons we refer to the current Supreme Court majority as “The 1% Court” is its enthusiasm for inflicting forced arbitration on consumers. You remember the CFPB. That’s the agency Republicans hate so much that they’ve vowed to filibuster anyone President Obama nominates to run it unless the President agrees to eviscerate Wall Street reform. 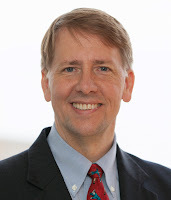 That includes the current agency director, Richard Cordray, named to the position through a recess appointment that was called into question by a ruling of the D.C. Circuit Court of Appeals. The new forced arbitration regulation makes clear what this fight and the other fights over President Obama’s nominees really are all about. They’re about Republicans who can’t stand Wall Street reform or consumer protection or anything that gives everyday Americans a fighting chance against corporate special interests. That’s why the fights ahead over Cordray, and President Obama’s nominees to the D.C. Circuit and his nominees for posts like Secretary of Labor, Environmental Protection Agency Administrator and the National Labor Relations Board, are so important. That’s why, if Senate Republicans refuse to allow yes-or-no votes on these nominees, the Senate majority needs to revisit reforming Senate rules. Over the past week, a chorus of congressional Republicans has criticized President Obama for fulfilling his constitutional duty to nominate qualified individuals for the three open seats on the D.C. Circuit Court of Appeals, the second-highest court in the land. Eight years ago this week, they were singing a far different tune. On May 23, 2005, the so-called Senate “Gang of 14” agreement set the stage for up-or-down votes on a number of extremely conservative Republican judicial nominees. That agreement paid almost immediate dividends for a slate of conservative judges, particularly during this week in 2005. On June 8, 2005, the Senate confirmed Janice Rogers Brown – who once referred to the onset of the New Deal as the “triumph of our own socialist revolution” – to the D.C. Circuit Court of Appeals. The next day, the Senate confirmed William Pryor to the 11th Circuit; among other things, Pryor had defended Alabama’s power to execute juveniles and the mentally retarded as the state’s Attorney General. Less than a week later, on June 14, the Senate confirmed Thomas Griffith to the D.C. Circuit. In all, five circuit court judges were confirmed within a week, two of whom still sit on our nation’s second most important court – the D.C. Circuit Court of Appeals. Today, Republicans have engaged in all manner of obstructionism to prevent President Obama’s highly qualified and diverse judicial nominees from ever taking the bench. Nowhere is this more apparent than the D.C. Circuit. Caitlin Halligan was filibustered twice before asking the President to withdraw her nomination, even after she received the American Bar Association’s highest possible rating of unanimously well qualified. Sri Srinivasan waited nearly a year before he was unanimously confirmed to the D.C. Circuit last month. Now, Republicans have pushed forward a bill to reduce the size of the D.C. Circuit by three seats, seeking to deny President Obama any opportunity to install judges with a clear respect for the rule of law on a court that is currently dominated by radical conservatives. Although the confirmations of Janice Rogers Brown and Thomas Griffith brought the D.C. Circuit’s membership to 11 judges, Republicans have apparently decided that with President Obama in office, eight is enough. President Obama has nominated three highly qualified, uncontroversial nominees to the D.C. Circuit. At the same moment in President George W. Bush’s second term, facing a lower court workload, Republicans threatened to change the rules in order to fill all 11 seats on the D.C. Circuit. While the nominees put forward by President Bush were hyper-partisan, President Obama’s nominees have a clear record of exceptional qualifications and should be swiftly confirmed. We applaud President Obama for nominating supremely qualified individuals to the three vacancies on the D.C. Circuit, the nation’s second most important court, and we commend him for sending a bold, public signal that these nominees are a top priority. These choices also reflect the president’s outstanding record for increasing diversity on the federal bench. We were pleased to stand with the President at today’s announcement, and we are pleased to stand with him in his effort to fill these seats. Now Senators must fulfill their constitutional duty by swiftly reviewing and voting yes or no on these nominations. There is no excuse for delay. The D.C. Circuit decides cases that affect every aspect of all Americans’ lives, from the air we breathe to workplace safety to the health of our families to the ability to regulate financial institutions. This court needs to be at full strength in order to manage its critically important caseload, the unique nature of which may well affect the ability of the government to serve the public interest. With stakes this high, we are prepared to join with President Obama as he champions the effort to ensure that the Senate fulfills its constitutional obligation to fill the circuit’s ninth, 10th and 11th seats without delay — just as it did during President George W. Bush’s administration. There has never been a more important time for all who care about the future of our country to mobilize against the destructive tactics of obstruction that have wounded our courts and damaged public confidence in our democratic institutions. ●Read Nan Aron’s column about the D.C. Circuit in The Huffington Post. ●Read more about the D.C. Circuit. With battles ahead over President Obama’s choices for Secretary of Labor, Environmental Protection Agency Administrator, Consumer Financial Protection Bureau Director and the National Labor Relations Board, and fights over the nation’s second most important court likely to follow, democracy itself is on trial in the United States Senate. If Republicans persist in preventing yes-or-no votes on President Obama’s executive and judicial nominees, the only recourse will be for the majority to revisit Senate rules reform and put an end once and for all to Republican efforts to subvert the Senate’s constitutional obligation to provide advice and consent. The first test is likely to come this week. Senate Majority Leader Harry Reid says he will schedule a vote on President Obama’s nominee to lead the Consumer Financial Protection Bureau, Richard Cordray. The CFPB was created as part of the Wall Street Reform law as an agency solely devoted to protecting consumers of financial products from mortgages to credit cards. In a transparent effort to protect the very special interests that collapsed our economy and brought ruin to so many Americans, Republicans so far have refused to confirm Cordray. In fact, Republicans have said they won’t confirm anyone to run the CFPB. Republicans have been equally obstinate about the president’s nominees for the National Labor Relations Board, the independent agency charged with protecting the rights of workers – and a hearing on those nominees just last week showed no thaw in that obstinacy. That’s why Cordray and some of the current NLRB members had to be named through recess appointments. But three Republican-appointed judges of the United States Court of Appeals for the District of Columbia Circuit, breaking with decades of precedent, decided that the President doesn’t have the power to make such recess appointments. The decision is part of a pattern in which the D.C. Circuit consistently sides with corporate interests over workers and consumers – blocking Wall Street reforms, undermining labor rights, and rolling back environmental protections. So it’s no wonder that Republicans also are trying to prevent the president from restoring balance to the D.C. Circuit, which is currently dominated by Republican appointees. The latest underhanded tactic from Republican Senators amounts to a ‘pre-emptive filibuster’ – an effort to eliminate three of the four vacant judgeships on the court in order to prevent President Obama from filling those seats. But even that isn’t the end of the obstruction. We are pleased that two Senate committees were able to overcome Republican stalling tactics and vote last week in favor of President Obama’s highly-qualified nominees to lead the Department of Labor and the Environmental Protection Agency. The next step must be swift yes-or-no votes by the full Senate on the nominations of Tom Perez and Gina McCarthy. Unfortunately, these two outstanding nominees’ ordeals may be far from over. All of the Republicans on both committees voted no. As AFJ has pointed out before, to Senate Republicans, one of the only things as bad as a Labor Secretary who will protect working people is an Environmental Protection Agency administrator who will protect the environment. A solid majority of voters twice has made clear that they support the approach to government taken by Barack Obama. In response, the Republican strategy boils down to rule-or-ruin. They have shown themselves prepared to paralyze government, no matter what the cost to the American people. In the days ahead, we will see if the Senate is ready to break free of this paralysis. Sen. Charles Grassley (R-Iowa) deserves “an ‘A’ for creativity but an ‘F’ for content” for his scheme to obstruct future nominees to the nation’s second most important court, Alliance for Justice President Nan Aron said Thursday. Aron was referring to Grassley’s plan to eliminate three of the four vacant judgeships on the United States Circuit Court of Appeals for the District of Columbia Circuit, a plan he raised again at a Senate Judiciary Committee meeting Thursday. During that meeting, the committee voted in favor of president Obama’s nomination of Sri Srinivasan to fill one of four vacancies on the 11-judge court. “But don’t be fooled: Today’s vote by no means shows Republicans’ willingness to stop playing games with the president’s nominees. During the same meeting, Grassley announced what amounts to a ‘pre-emptive filibuster,’ declaring his intent to eliminate the other three vacancies on the D.C. Circuit, effectively blocking any nominees to those seats,” Aron said. Grassley cited what he claimed is a light workload for the court, based solely on the number of cases handled by each judge. “That claim is as nonsensical as it is hypocritical,” Aron said. Aron also noted that “less than a week ago, at another meeting of the same committee, Sen. Grassley’s close Republican ally, Sen. Jeff Sessions said it was wrong to measure caseload by raw numbers without factoring in complexity. 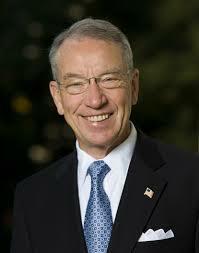 “The hypocrisy is clear when one looks at Sen. Grassley’s own record. When the caseload on the court was lighter than it is now, Sen. Grassley supported President George W. Bush’s nominees to fill all eleven seats on the court. Republican obstruction of the president’s nominees on the Senate floor through use of (often silent) filibusters has been well-documented, but in the past two days the public has seen what those of us working on judicial nominees have known for far too long – the obstruction is often just as bad at the committee level. 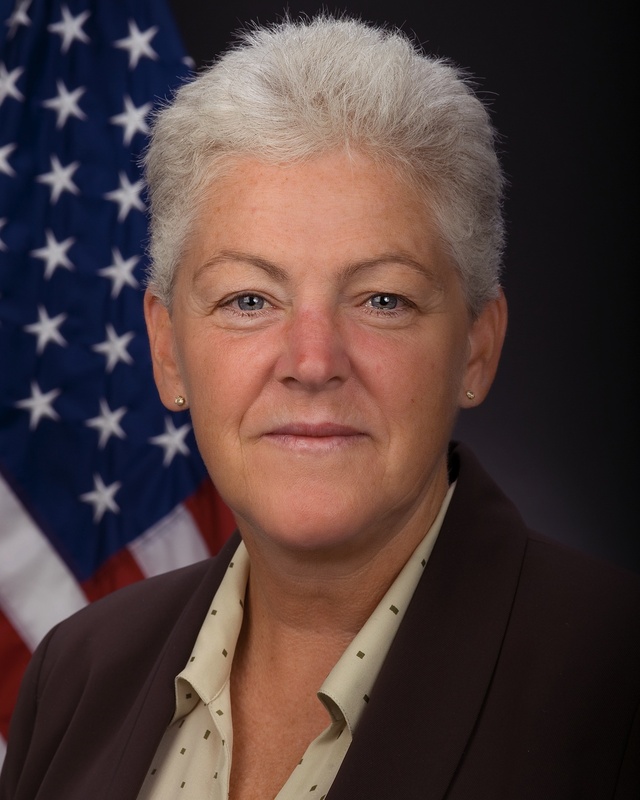 Just one day after using an arcane procedural maneuver to delay a committee vote on the nomination of Tom Perez to serve as Secretary of Labor, Senate Republicans have used another underhanded ploy to delay a committee vote on the nomination of Gina McCarthy to lead the Environmental Protection Agency. They boycotted a meeting of the Senate Committee on Environment and Public Works to prevent the Committee from even holding a vote. Committee Republicans could hardly argue they lacked sufficient information to form an opinion on McCarthy – she answered more than 1,000 questions from committee members. On one level this behavior is understandable. To Senate Republicans, one of the only things as bad as a Labor Secretary who will protect working people is an Environmental Protection Agency administrator who will protect the environment. But the brazen nature of these committee delay tactics is shocking nonetheless. Unfortunately, in the context of judicial nominations, such committee delays have become commonplace – and start even earlier in the process. By committee tradition,* the Senate Judiciary Committee typically won’t hold a hearing on a judicial nominee unless both home-state senators agree to allow the nomination to move forward. Like any such tradition, it works only as long as it is not exploited. But that is exactly what Senate Republicans are doing now. That means some judicial nominees are stuck in limbo waiting for Judiciary Committee hearings months or years after they were nominated. In many more cases, the White House – reluctant to impose that fate on nominees – is left waiting in vain for Republican home-state senators to help identify acceptable candidates. And, coming full circle, hanging over all of this obstruction at the committee level (and sometimes before) is the knowledge that even if nominees survive those obstacles, they face the specter of the filibuster once they reach the floor. The events of the past two days make clear, once again, that the weak-kneed agreement on Senate rules reached in January cannot come close to constraining the Republicans’ willingness to turn rules and traditions into weapons of mass obstruction. The Senate needs to back to the drawing board and enact tough-minded rules reform now. In-depth report from The Huffington Post on how Republicans obstruct judicial nominees. Our overview of the need for Senate Rules Reform. The website of the rules reform coalition Fix The Senate Now. *-Although this tradition has been in place to some degree for many years, not all Judiciary Committee chairmen have been as generous as the current one in waiting for both home-state senators to indicate assent before holding a hearing. As expected, the Obama Administration is asking the Supreme Court to review a ruling by the United States Court of Appeals for the District of Columbia Circuit that nearly eliminates the ability of a president to make “recess appointments” to federal agencies. With Senate Republicans abusing the filibuster at an unprecedented rate, a recess appointment sometimes is the only way to fill vacancies. Indeed, Republicans have used the filibuster to cripple agencies they don’t like, such as the National Labor Relations Board (NLRB) and the Consumer Financial Protection Bureau. But when the president used his only alternative, recess appointments, the D.C. Circuit broke with decades of precedent and decisions from every other circuit to rule on the issue to invalidate those appointments. The decision being appealed now, discussed in detail in this previous post to Justice Watch, left the entire NLRB in limbo. That post also discusses the fact that this kind of extreme activism is nothing new for the conservatives on the D.C. Circuit – a court widely viewed as the nation’s second most powerful. They get away with it because there are four vacancies on the eleven-member court, and among the remaining seven judges, conservatives hold a majority. Senate Republicans are going to extremes to try to keep it that way. First, they filibustered an excellent nominee, Caitlin Halligan, and now some Republicans are trying to eliminate three of the Court’s seats. The Supreme Court should hear this challenge as soon as possible. President Obama needs to move full speed ahead and send the Senate enough nominees to fill every vacancy on the court. And Senate Democrats need to reform Senate rules, if that’s what it takes, to break the Republican addiction to obstruction. 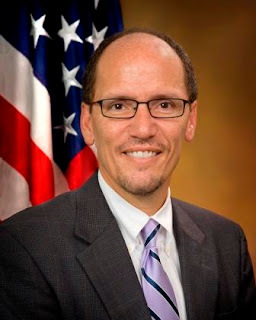 On April 18, Assistant Attorney General Thomas Perez, President Obama’s nominee for Secretary of Labor, testified before the Senate Committee on Health, Education, Labor & Pensions. In particular, as found in an Inspector General report issued in January 2009, the Division had implemented illegal personnel practices, including making hiring decisions and case assignments based on partisanship rather than merit, and we observed that there were severe continuing consequences for morale, management, and effectiveness. Fortunately, under Perez’s stewardship, the Civil Rights Division has experienced a remarkable turnaround, restoring its reputation as a stalwart defender of federal civil rights laws. Over the last four years, the Division has renewed enforcement of predatory lending, disability, employment discrimination, hate crimes, and veterans’ rights laws. Furthermore, Perez enjoys broad, bipartisan support. Dozens of groups, from civil rights advocates to business leaders, have written letters endorsing his nomination and urging his confirmation as Secretary of Labor. However, a minority of Republicans have threatened to filibuster, continuing an addiction to obstruction of President Obama’s nominees. 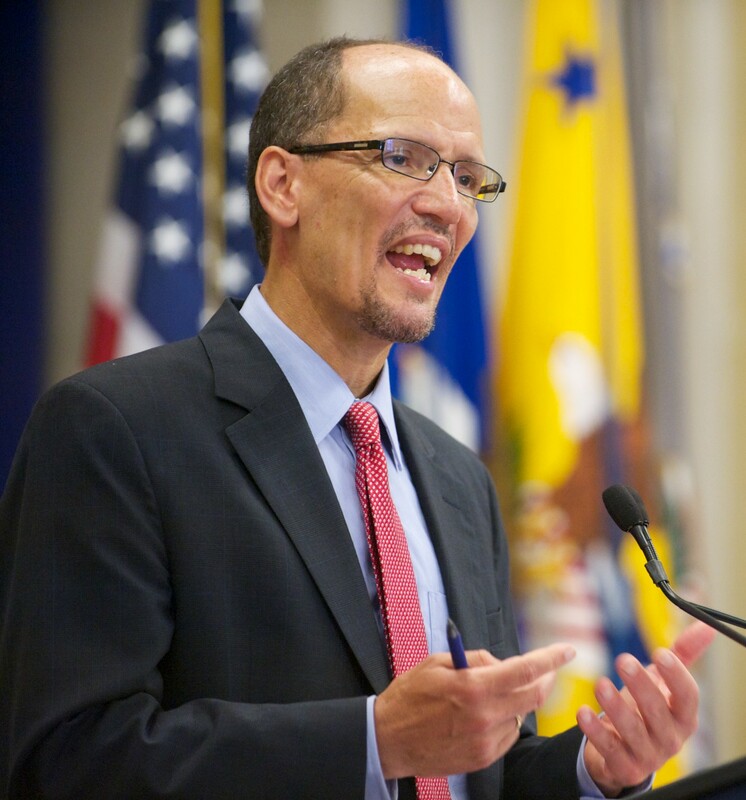 There is no doubt that Tom Perez is a highly qualified, dedicated nominee to serve as Secretary of Labor. He has spent his professional career in public service, committed to ensuring a fairer and more just society for all Americans. Alliance for Justice strongly endorses Assistant Attorney General Perez’s nomination as Secretary of Labor, and we hope for his swift confirmation. Alliance for Justice is proud to join with more than 80 other organizations in supporting this nomination. Learn more about Tom Perez here. As we’ve noted in the two previous posts to this blog, right now more than one-third of the seats on the United States Court of Appeals for the District of Columbia Circuit – four out of 11 – are vacant. Last month, a Republican filibuster prevented a highly-qualified nominee, Caitlin Halligan, from filling one of those seats. Earlier this week, the Senate Judiciary Committee held a hearing on another nominee, Sri Srinivasan. But even if Srinivasan ultimately is confirmed, that still leaves three vacancies on what has been called the second most important court in America. Legislation sponsored by Sen. Charles Grassley (R-Iowa) to reduce the number of judges on what is widely viewed as the nation’s second most important federal court is a “court-packing scheme” to keep the court in the hands of staunch conservatives, according to Alliance for Justice. Claims by Grassley and others that the court’s workload doesn’t justify the current number of judges are “false and hypocritical,” said AFJ President Nan Aron. The withdrawal of this highly-qualified nominee is one more illustration of the extent to which Republicans have used unprecedented, partisan obstruction to hijack the United States Senate. It is still another indication, as if any were needed, that Senate Democrats need to revisit Senate rules reform, and stand up to the tyranny of the minority. 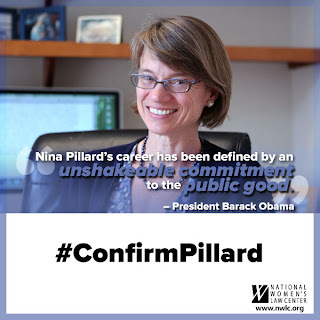 We are confident that President Obama now will press ahead with nominating individuals to fill all three D.C. Circuit vacancies still without nominees – and will make the fight for these nominees a top priority. Read more about Caitlin Halligan here. 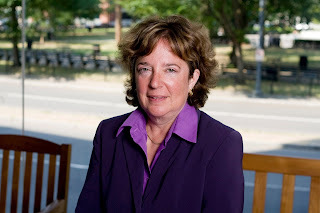 In the previous post to this blog, we said that today’s cloture vote on the nomination of Caitlin Halligan for the U.S. Court of Appeals for the D.C. Circuit would tell us if Senate rules reform is for real. Earlier this week, we urged Republican senators finally to put partisanship and obstruction aside and vote for cloture on the nomination of Caitlin Halligan to serve on the D.C. Circuit Court of Appeals. But it appears that urging Republican senators to rise above partisanship is like urging three-pack-a-day smokers to “just say no” to tobacco. Today, Republican Senators proved themselves to be addicted to obstruction, and utterly uninterested in putting the needs of the American people ahead of partisan posturing. As a result, for the second time in two years, Americans have been denied the services of a highly qualified nominee to serve on what is widely considered the nation’s second most important court. There is no justification for this level of opposition. Halligan’s nomination has strong bipartisan support, including endorsements from the National District Attorneys Association, the New York State Sheriff’s Association and two former assistants to Solicitors General under Republican administrations. Her credentials are impeccable and she was rated “well qualified” by the American Bar Association. The vote today also makes clear that the recent agreement to ‘reform’ Senate rules really was no agreement at all, but rather a blank check for continued obstruction. We believe the Senate majority needs to reconsider the terms of this agreement, and revisit serious rules reform. One could argue that Caitlin Halligan was the victim of partisan obstruction, but it’s more than that: the American people are the victims. Not only is a well-qualified nominee once again in limbo, the D.C. Circuit will continue to limp along with four of its 11 seats vacant. Senate Majority Leader Harry Reid tonight filed a motion for cloture on the nomination of Caitlin Halligan for the U.S. Court of Appeals for the District of Columbia Circuit. A vote is expected Wednesday morning. This week, we find out if the agreement reached at the start of the current session to reform Senate rules has any real meaning. Without question, Caitlin Halligan is extraordinarily well qualified for a seat on the D.C. Circuit Court of Appeals. Her nomination has strong bipartisan support. The fact that a minority of senators could stop a highly-qualified nominee like Caitlin Halligan in 2011 is a classic example of the misuse of the filibuster for partisan gain that has characterized the current Senate minority. President Obama has renominated Halligan, but Republicans are threatening a filibuster once again. Senate Majority Leader Harry Reid has filed a motion for cloture. If the motion fails and Republicans succeed in filibustering Halligan for the second time in as many years, it will make clear that the recent agreement to “reform” Senate rules really was no agreement at all, but rather a blank check for continued obstruction. We urge senators finally to put partisanship and obstruction aside and vote for cloture. Click here to find out more about Caitlin Halligan and the D.C. Circuit. 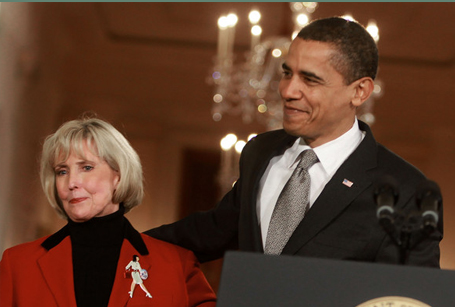 Lilly Ledbetter Fair Pay Act four years ago today. Four years ago today, President Obama signed the Lilly Ledbetter Fair Pay Act. The law undid some of the damage caused by the notorious Supreme Court decision in Ledbetter v. Goodyear Tire & Rubber Co. Had Congress not acted, the decision would have made it vastly more difficult for women to sue when they are denied equal pay. The Lilly Ledbetter Fair Pay Act changed that. But more is needed. Employers still can bar employees from discussing their wages – and retaliate against workers who do. Obviously, you can’t sue for wage discrimination if you don’t know you’re being paid less than another employee for the same work. In addition, an employee who wins can receive back pay, but no compensatory or punitive damages. The Paycheck Fairness Act. It passed the House of Representatives and had the support of a majority of senators – but not the 60 votes needed to break a Republican filibuster. Still, President Obama can take some action on his own. The Coalition is urging him to issue an executive order banning contractors who do business with the federal government from retaliating against workers who discuss their own pay. Today’s agreement to enact incremental reforms to Senate rules, while containing some provisions that may prove to be of significant value in mitigating the calamitous mistreatment of judicial nominations, does not go as far as we would like in the direction of meaningful change on the broader issues confronting our country. While we are particularly happy to see long-overdue changes to the rules governing filibusters of district court nominees, we remain disappointed that circuit court nominations remain subject to the kind of destructive obstruction that has characterized President Obama’s first term. Limiting post-cloture debate to two hours serves as an implicit acknowledgement of the unprecedented degree to which Republicans have inappropriately used procedural weapons to delay and derail these important nominations. This agreement holds out hope that some degree of comity may now return to the Senate for district court nominees, but at the same time we urge Senate leaders to use every tool at their disposal to prevent the widespread obstruction of circuit court nominees that has characterized the past four years. Although we had hoped for a more robust package, we are encouraged by the spirit of reform and activism led by Sens. Jeff Merkley, Tom Udall, and Tom Harkin, carried forward by dozens of organizations, and given voice by hundreds of thousands of Americans, hungry for progress, who contacted their senators to demand change. The American people deserve a Senate that is willing and able to tackle the great issues that confront the nation, and we will watch diligently in the days ahead to see whether today’s agreement is sufficient to ensure that is the case. Jefferson Smith, the fictional filibustering senator in Mr. Smith Goes to Washington, has captivated the imaginations of many Americans. But when was the last time a senator took a principled stand in the form of an around-the-clock speech, then collapsed with exhaustion, having convinced the crooked political establishment to mend its misguided ways? 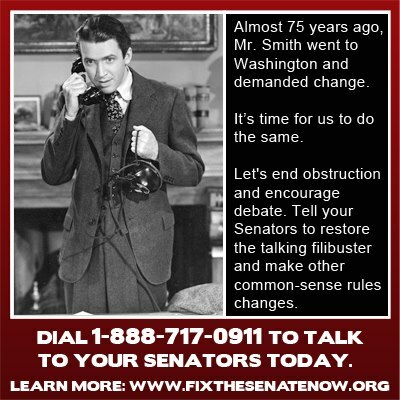 Now is the time to stop looking to a 73-year-old Hollywood movie for inspiration and start fixing the way the Senate does business so that a latter-day Mr. Smith can actually take a stand for genuine matters of principle. There’s growing momentum to end legislative obstruction by changing the rules when the new Senate reconvenes later this month. Sens. 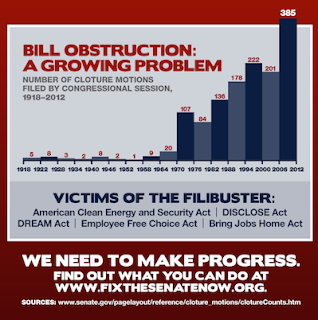 Jeff Merkley (D-Ore.) and Tom Udall (D-N.M.) have introduced Senate Resolutions 4 and 6, which mirror the filibuster reforms supported by Fix the Senate Now, a coalition of 50 progressive organizations. And Democrats have the votes to revamp the rules. Read the full column here – and please let readers know what you think by clicking “like” and posting a comment on the Huffington Post site. We’ve stepped up our campaign for Senate rules reform with a petition drive. Please sign our petition urging Senators to cosponsor Senate Resolution 4. The resolution makes several key changes to Senate rules to end the unprecedented obstruction that has brought the business of the Senate almost to a halt. One piece of progressive legislation after another has been killed by filibuster. Scores of judicial nominations have been delayed – and now some Republicans may use the filibuster against President Obama’s Cabinet nominees. Without rules reform, the gridlock continues. That means the fate of almost every other big issue before Congress – from gun control to who sits on the federal bench to who leads the most important agencies in the executive branch – may depend on the outcome of the rules reform fight. The decision by Senate Majority Leader Harry Reid (D-NV) to enter into direct talks with Minority Leader Mitch McConnell (R-KY) on curbing the abuse of the filibuster shows the growing strength of the movement for real reform of Senate rules. And we can put the time to good use by redoubling our efforts for real reform. We’ve written often about the failure of the United States Senate to confirm judges. But that failure is part of a wider failure – the failure of the Senate itself, brought on by the unprecedented misuse of arcane rules and procedures by the Republican minority. It’s not only judicial nominations that are at stake. The filibuster has been abused to derail vital legislation, supported by a majority of the American people, and a majority of U.S. Senators, paralyzing progress on jobs, clean energy, workers’ rights, and immigration. To an extent unprecedented in American history, 60 votes has become the needed threshold for nearly every order of Senate business. Under the current broken system, senators do not even have to stand up and talk to block a bill. We believe they should be accountable for their actions. ● Reduce the time for debate on nominations. ● Require that if Senators want to filibuster, they have to do it the old-fashioned way – stand up and talk. Now a Senator can derail a bill merely by saying he or she intends to filibuster. ● Necessitate 41 votes to keep a filibuster going – instead of requiring the majority to muster 60 votes to stop it. ● Allow only one filibuster per bill – now even the decision to discuss a bill at all, called a motion to proceed, can be filibustered. Read more about Senate rules reform here. When the next Congress takes office in January, the Senate will have one opportunity to reform the rules with a simple majority vote. We are already gaining extraordinary momentum and are confident with the outcome this time around. But we can’t do it without you! 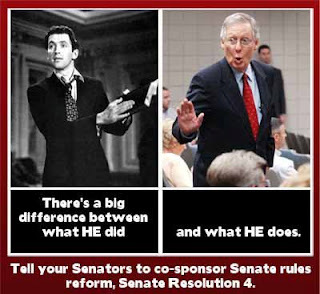 We need you to join us in a national day of action to support Senate rules reform. Call 1-888-717-0911 today and ask your senators to support reforms that will ensure that they can debate and vote on the critical issues facing our country. The New York Times takes on "a severe breakdown in the process for appointing federal judges"
There has been a severe breakdown in the process for appointing federal judges. At the start of the Reagan years, it took, on average, a month for candidates for appellate and trial courts to go from nomination to confirmation. In the first Obama term, it has taken, on average, more than seven months. Seventy-seven judgeships, 9 percent of the federal bench (not counting the Supreme Court), are vacant; 19 more seats are expected to open up soon. The lack of judges is more acute if one considers the growing caseload. The Judicial Conference, the courts’ policy-making body, has recommended expanding the bench by 88 additional judgeships. President Obama must make fully staffing the federal courts an important part of his second-term agenda — starting with the immediate Senate confirmation of the 18 nominees approved by the Senate Judiciary Committee. A significant reason for the slowdown has been the partisan opposition of Republicans to appeals court and even to trial court nominations, even though almost none of the nominees have backgrounds that raise ideological issues. The Republicans have time and again used the filibuster, the threat of filibuster, holds on nominations and other tactics to block confirmations. The Democratic majority, led by Senator Harry Reid, can speed up the process by limiting use of the filibuster. He can do so by pushing for a simple majority vote at the start of the January session to alter Senate rules so that every judicial and executive-branch nominee is assured an up-or-down vote within 90 days. Without that change, many judicial nominations will founder. … remember how, on Friday, when commenting on Senate Minority Leader Mitch McConnell filibustering his own bill, AFJ President Nan Aron said: “If we didn’t know better we’d think Sen. McConnell was moonlighting as a writer for The Daily Show or The Colbert Report”? And remember how on Twitter we said people should watch the self-filibuster before The Daily Show got hold of it? As we’ve noted before on this Blog, the failure of the United States Senate to confirm judges is part of a wider failure – the failure of the Senate itself, brought on by the unprecedented misuse of arcane rules and procedures by the Republican minority. That’s why AFJ is a leader of a coalition called Fix The Senate Now. 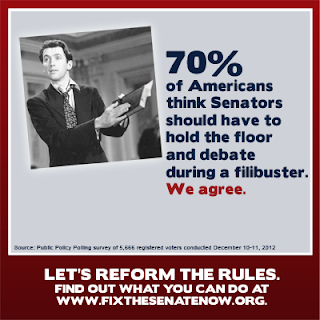 And that’s why today we debut a new resource page on the urgent need for Senate rules reform. The page sums up what’s wrong, and links to a set of crucial proposed reforms. Our take on Mitch McConnell’s "self-filibuster"
WASHINGTON, D.C., Dec. 7: The spectacle of the Minority Leader of the United States Senate filibustering his own bill perfectly illustrates the extent to which the filibuster has been abused for purely partisan purposes, according to the Alliance for Justice. Yesterday, Sen. Mitch McConnell (R-Ky.) introduced a bill to allow the President to raise the federal debt ceiling on his own authority. The idea was to show that Democrats didn’t have the votes to pass such a measure. But when it turned out the Democrats did have the votes, McConnell was in a bind. His only way out: filibuster his own bill. “If we didn’t know better we’d think Sen. McConnell was moonlighting as a writer for The Daily Show or The Colbert Report,” said Nan Aron, President of the Alliance for Justice. “But Sen. McConnell’s theater-of-the-absurd actually illustrates an extremely serious problem: the paralysis in the Senate caused by Republican abuse of the filibuster. “The filibuster was intended to be used in extreme circumstances, where fundamental principles were at stake,” said Aron. “But Senate Republicans have turned it into a weapon of mass obstruction to bring the business of the Senate to a halt. “Nowhere is this more apparent than in our federal courts. As we document in our recent report, Senate Republicans repeatedly have abused the filibuster to block votes on nominees for federal judgeships – including noncontroversial nominees with broad bipartisan support. That’s led to unconscionable delays and severe hardship for hundreds of thousands of Americans, forced to wait months, sometimes years to fight for their rights in court. AFJ has a briefing paper on the impact of the filibuster on judicial nominees. We’ve written a lot about the failure of the United States Senate to confirm judges. But that failure is part of a wider failure – the failure of the Senate itself, brought on by the unprecedented misuse of arcane rules and procedures by the Republican minority. In addition to obstructing scores of judicial nominees, the abuse of rules, particularly the filibuster, has doomed one essential piece of legislation after another, such as energy and climate legislation, the DREAM Act, and the Employee Free Choice Act. That’s why AFJ is among the leaders of a coalition called Fix The Senate Now. And now, in a new report, AFJ is connecting the dots – illustrating the direct link between Republican stalling tactics and the crisis on the federal bench. We support modest reforms to restore balance to the legislative process. America simply cannot function with a Senate in paralysis. Click here to read AFJ’s report: Senate Rules Reform and Republican Obstruction of Judicial Nominees. Jeffrey Toobin, author and legal analyst for The New Yorker and CNN (and guest at a big AFJ event in New York City in December) has an important column on the New Yorkerwebsite today on the urgent need to reform Senate rules. In particular, he endorses a proposal that would curb the filibuster, which has been used by Senate Republicans to block almost every major Obama administration initiative. As is discussed in detail in the previous post, it’s also contributed to a critical shortage of judges, because it’s been misused to block the confirmation of federal judges – even those who are considered noncontroversial. The theory behind their idea is that the requirement to stand up and filibuster would create a real deterrent to the profligate use of the tactic. It’s a modest change—filibusters would still exist—but a useful one. Though Toobin doesn’t mention it, this change also would make the misuse of the filibuster to obstruct the work of the Senate more visible – and audible – to the American people. They could watch Senate business grind to a halt as Senators filled hour after hour on C-SPAN for days at a time. Senate leaders tend to be institutional conservatives, who worry, with some justification, that their party will be in the minority some day. But Republican obstruction has become such an obstacle to legislative progress that the risk seems worth taking. This is especially true because judicial nominations are likely to be more of a focus for President Obama in his second term. With the House in Republican hands for the foreseeable future, it is unlikely that major legislation will pass both bodies of Congress. But the Senate has a constitutional obligation to take up Obama’s judicial nominees—and the fights over them are likely to be fierce. If Reid and his fellow Democrats give up on filibuster reform, they will likely doom the President’s second-term legacy before he even has a chance to write it. If you’d like to ask Jeffrey Toobin about this yourself, or hear more from him on this topic, the current state of the Supreme Court and other concerns, please join us in New York City on the evening of Dec. 6, when he discusses these issues with AFJ President Nan Aron. The event is free, and you can register here. We are pleased that, so soon after re-election, President Obama appears to be making it a top priority to fill longstanding vacancies on the federal courts. We agree. These nominations continue the president’s exemplary record when it comes to diversity in gender, ethnicity and sexual orientation – the best record of any president (for details, see AFJ’s Judicial Selection Snapshot). In addition, we are pleased that two of the nominees come from professional backgrounds that include service to everyday Americans and reflect the full diversity of the legal profession. Raymond Moore, nominated for the District of Colorado, is the chief public defender for federal cases in Colorado and Wyoming, and Judge Will Thomas, nominated for the Southern District of Florida is a former public defender. Meanwhile, 19 other nominees, already put forward by the president and approved by the Senate Judiciary Committee, await action by the full Senate during the current lame-duck session. This at a time when there are scores of vacancies on the federal bench. There is much truth to the cliché that justice delayed is justice denied. These nominations bring thousands of Americans a step closer to justice. The Senate should vote, now, to confirm those nominees. Please click here to tell your Senator to do just that. Democratic Senators took to the floor of the Senate today to protest the unprecedented level of obstruction towards nominees by their Republican colleagues. The Obama administration has 64 nominees pending in the Senate. Over half of Bush’s nominees were confirmed by either unanimous consent or voice vote. In this Congress, Republicans have required cloture votes on uncontroversial nominees such as as Barbara Keenan for the 4th Circuit Court of Appeals who was ultimately confirmed by a vote of 99-0. That’s right, 99-0. The same people who requested the vote did not even voice opposition. They are stalling not on the basis of the nominees’ records or qualifications, but simply to obstruct Obama’s nominees. In addition to Keen, there is the example of Judge Greenaway, despite the fact that he was reported out of committee unopposed and was confirmed without opposition, he had to wait 235 days—almost eight months—for a final vote where he was confirmed 84-0. Jane Stranch and Thomas Vanaskie are rapidly approaching that same timeline, both have been waiting 218 days. There are currently 102 federal court vacancies, and according to the Senate Judiciary Committee, 31 of those vacancies are classified as “judicial emergencies” because of the size of the caseload in the court or the amount of time a seat has sat empty. Guest Post: By Chris Cassidy, Assistant Director of Communications, American Constitution Society for Law and Policy. The views expressed here are solely attributable to Cassidy. Intra-party struggles, the Bush recession, sharp departures from our commitments to international and domestic law — none of these developments even competes with the impact of the modern filibuster on American politics. After winning the White House and amassing super-majorities in both houses of Congress, reforms are creeping through legislative channels at a perilously slow pace. With the bipartisan support of her home state’s senators, Dawn Johnsen’s nomination remains stalled over a year since being announced. Meanwhile the majority party seems on the verge of panicking over mid-term elections which may leave them with only 54 seats in the Senate. Yes, 54 seats in the Senate would still be a majority. Yes, 54 seats used to be enough to move nominations and legislation. No, this is not a joke. These are the very serious consequences of a parliamentary procedure run amok. In the 1950s, filibusters were invoked just once per Congress, on average. In the last Congress, there were 139. With Republicans feverishly invoking the filibuster at every turn, there has been no shortage of suggestions for how to reform Senate rules to empower legislators to legislate. I do not jump onto the bandwagon calling for reform without hesitation, however. Let’s not leave recent Democratic filibusters unacknowledged. There is something to be said for a system that permits the minority party to moderate judicial nominations. For instance, though used considerably less then, the filibuster proved useful in blocking extremists nominated to the federal bench by President George W. Bush. But blocking extremists doesn’t seem to be the prerogative of today’s Republican Senators. President Obama’s nomination of Judge David Hamilton for the Seventh Circuit Court of Appeals was almost universally welcomed as a gesture towards bipartisanship. Hamilton’s moderate credentials earned him the support of Republican Senator Richard Lugar as well as the head of the Federalist Society’s Indianapolis chapter. With Senator Jeff Sessions leading the way, however, Senate Republicans launched an effort to block Hamilton’s nomination, citing one month that he worked with ACORN in 1979 and shamelessly distorting his distinguished judicial record. The question remains: How do we eliminate knee-jerk filibusters of every legislation and nominee, while preserving the legitimate, counter-majoritarian purpose that the filibuster once served. A solution may be on the way to the Senate floor as we speak. Sen. Tom Harkin has indicated that, in the coming weeks, he will re-introduce a bill that would change Senate rules to end the minority party’s veto power, while preserving their ability to delay Senate action and inform the public debate. Harkin’s bill would permit a filibuster for a fixed period of time until it could be overcome by 57 votes. Should this be insufficient, debate would continue until the time limit is again reached, and cloture could be invoked by 54 senators. Eventually, 51 senators could pass legislation or advance nominations. Senator Harkin initially proposed the bill in 1995, when he and his fellow Democrats were in the minority. This time, though, he hopes that the devastating gridlock on Capitol Hill will move his fellow senators to action. While the chances for Harkin’s bill remain unclear — it would require 67 votes to change Senate rules — the public interest would clearly be best served by bringing an end to the era of minority rule in which we find ourselves. The alternative is that each administration, whether Democrat or Republican, risks becoming a placeholder incapable of legislating or filling judicial and executive vacancies. The American people deserve better, but we will not be extended change without demanding it. Why Did Republicans Boycott the Senate Judiciary Hearing on Hamilton? Most of the Senate Judiciary Committee’s Republican members boycotted the confirmation hearing on President Obama’s first judicial nominee, Judge David Hamilton. A few weeks ago, all 41 Republican Senators sent a letter to President Obama , threatening that they will use filibusters to prevent majority votes on any nominee who will not rule based on the political agenda of the Republican senator from their home state. Consumers can be required to pay for merchandise received in the mail even if they never ordered it. Hospital executives could fire a nurse after she said publicly that she believed new staffing policies jeopardized the health of mothers and their babies. An employee could be fired for complaining about serious racially inflammatory comments in the workplace. Republicans were all in favor of a straight majority vote – with no filibustering – to support judges with that kind of political agenda. With the appointment of Judge Hamilton, President Obama has signaled that he will nominate highly qualified judges who will uphold our Constitution and the law to provide equal justice and protect personal freedoms for everyone in America, not just a few. The boycott is especially ironic given that Judge Hamilton not only meets those high standards, he is supported by the Republican Senator from his home state of Indiana, Richard Lugar (R-IN). Still not sure that the Republicans are doing all they can to ensure the courts carry out their political agenda? What else explains the blatant hypocrisy of saying the Senate had no right to question President Bush’s nominees, but President Obama must first get the Republicans’ blessing before making his nominations? The American people can’t let the Republicans block nominees who don’t support their political agenda. We can’t continue to have a country where there is one set of rules for a few at the top and a different set for the rest of us. 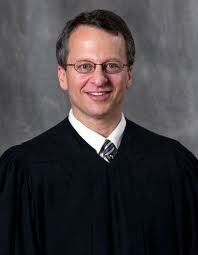 Find out more about Judge Hamilton and the Seventh Circuit Court of Appeals.